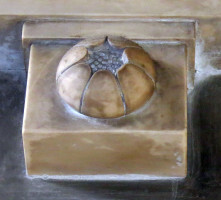 Portrait roundel from a monument, by Peter Rouw . The sculptor Peter Rouw the Younger is best remembered as a wax modeller, making small portraits in relief of great people of his time, but is of interest to these pages as a monument maker. 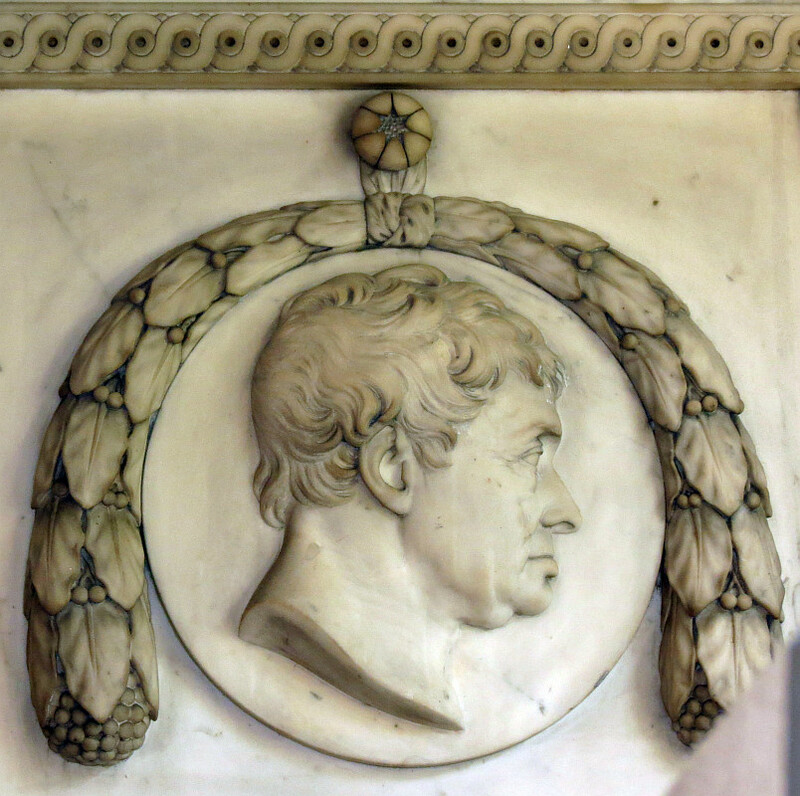 Peter Rouw studied at the Royal Academy Schools in 1788, and exhibited at the Royal Academy between 1787 and 1840, showing over 140 individual works, mostly medallion portraits in wax or in marble for monuments, medals, and several busts, either as models or finished in marble. From 1807 he is listed as ‘sculptor modeller of gems and cameos’ to the Prince, later King George IV. He was a Londoner, with a variety of addresses over the years, mainly in Portland Road, Norton Road and the New Road (later Euston Road etc). His students included Samuel Joseph, a fairly substantial sculptor, and among his friends was the famous sculptor Nollekens, who left him a slab of marble in his will, and £20 to his wife. In the year before he died, several of his works were exhibited at the Great Exhibition of 1851. His father was a sculptor of the same name, so our man is strictly called Peter Rouw the Younger or Junior. Another sculptor (and painter) in the family was Henry Rouw, thought to be a brother. His output was far smaller than Peter Rouw’s, but includes one splendid monument in London, to Lt.Col. Thomas Aubrey in St Mary’s Paddington Green. A certain R. Rouw exhibited one sculptural work at the Royal Academy but is otherwise obscure. Rouw’s church monuments, dating from the 1800s but mostly produced in the 1820s and 1830s, include several with medallion portraits, strictly in profile, beautifully executed and unsentimental, with the sculptor’s aim being fidelity, and with no attempt to idealise the subject. A good example is the portrait of Moses Haughton in Birmingham Cathedral (see this page), where we see an overweight personage, with jowled chin, prominent vein on the side of his head, and bags under the visible eye. But Rouw captures the spirit and dignity of the sitter and we could imagine the head turning towards us and fixing the viewer with a penetrating stare. Where he features the full figure, Rouw shows a commanding draughtsmanship and appreciation of the subtlety of the draped figure, and it is a shame that he was not commissioned to make more such works. 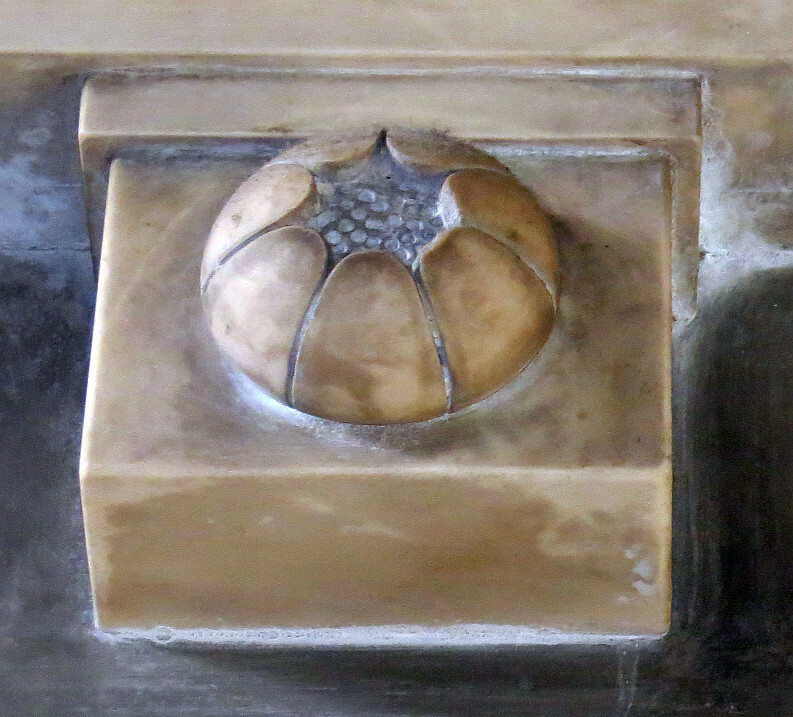 As a maker of medals and other works on the smallest scale, Rouw had an interest minor sculptural details, and several of his monuments feature what seems to be his signature embellishment of just-opening flowers, with many petals around the just-visible stamens within (see picture below). Peter Rouw's characteristic flower sculpture . Rouw’s works are fairly widely distributed. They include wax portraits in the National Portrait Gallery, and one of Wellington in the V&A. His funerary monuments may be found across the country, predominantly in southern England, but including works in Birmingham and elsewhere. 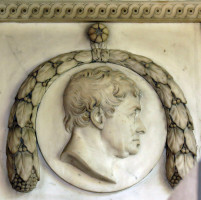 In London we can mention John Farquhar , in St John’s Wood Church, Sir Elijah Impey in St Paul Hammersmith, with a portrait medallion (see picture at top of page), and Rouw has simpler monuments with minor sculptural decoration in several other churches - for example both he and Henry Rouw are represented by works in St Mary Paddington Green.